Inlays are similar to fillings but the entire work lies within the cusps (bumps) on the chewing surface of the tooth. 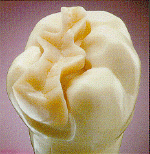 Onlays are more extensive than inlays, covering one or more cusps. Onlays are sometimes called partial crowns. Increase the strength of a tooth with respect to fillings. Alternative to an crown when teeth damage is not extensive. Porcelain inlays/onlays does not change color over time. 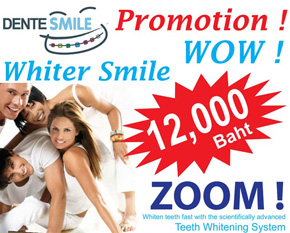 Gives better esthetic appearance compared amalgam fillings. 1. First evaluation and inlays/onlays tooth preparation. The natural tooth is reshaped to receive the new inlay / onlay. Records are taken to determine the color, length and shape of the inlay/onlay. An impression of the teeth is taken for a replica model of teeth. This model is sent to a lab where the inlay and onlay piece is fabricated. The preparation site is temprorarily covered. 2. Fitting of the inlay/onlay on delivery. The inlay/onlay is fitted and cemented into place on the teeth. A quality assurance check is done for any re-adjustments or re-works of the inlay/onlay dental crowns. 3. Care of inlay / onlay. Brush and floss your teeth as recommended by your dentist or dental hygienist.